Bring cash so that you stay in your budget! 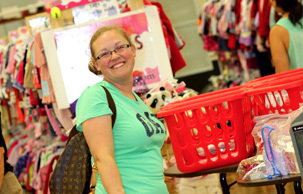 Make your shopping list: what will your child need for the next 6 months? Clothing & shoes (current size & 1 size up), books, toys, birthday gifts, and more. Trace your kiddos feet on cardstock or cardboard. Cut it out, write "Right" and "Left" and bring them with to the sale. This will help when purchasing shoes. Get your FREE admission ticket for May 12th-18th at eventbrite.com! State Fair does charge $6.00 per car for parking! Are you currently working as a Teacher? Then we welcome you to register via eventbrite. Please bring your school and photo ID to the presale along with your pass from eventbrite. Please note you may only attend the Teacher presale 4 times. After your 4th presale you are welcome to help at the sale and earn a presale pass. We have limited spots available and only those that register by Saturday, May 11th at 8am OR when spots fill up will be allowed to attend. No children allowed at the pre-sale except nursing infants under the age of 12 months in a "snugli" type carrier. NO wagons or strollers allowed. At the presale we can not allow strollers or wagons. We are thankful for the service and sacrifice your family makes everyday! 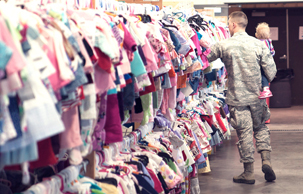 Get your Military Family Early Shopping Ticket at eventbrite.com. This free tickets lets you shop early on Saturday, May 11th 6-9pm! Those who are pregnant (with their first child!) or their first born is younger than 12 months of age. You will be eligible to attend our First Time Parent Presale!! As long as you fall under the above description and you sign up via event brite you can attend the "FTP" presale. You must register for each sale you wish to attend. First time Grandparent is someone whose FIRST grand child is 12 months of age or younger. Get your tickets at eventbrite.com. We get it raising kids is expensive! That is why we created #JBFMilwaukee - your partner in saving money. We want to help you save money while making some money. 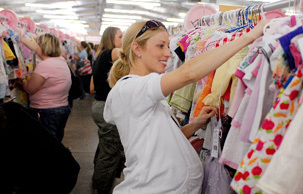 Join in on the fun as a consignor, shopper and or volunteer.